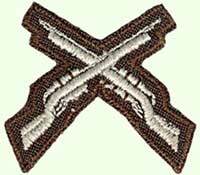 The Guard Force Stable Belt. This belt has been personalised. The badge is not normally worn as part of the buckle. 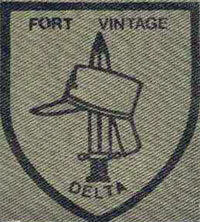 Comment from Dudley Wall: This shoulder flash is considered a fake as the proper title was KEEP Commander. Comment by Mario Doretti: I do not think this is fake because this is the last Intaf's rank when in 1975 it abandoned the role of protection of villages in favor of the new-born Guard Force. Therefore the P.V. Commander is senior to the Deputy P.V. Cmdr but under Cadet 1 and Cadet 2. This absolutely without taking anything away from great and fantastic work of Mr. Radford or Dudley Wall. This page updated in 2012 with images and information supplied by John Radford, and some debating material from Mario.